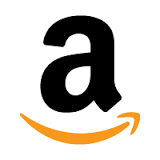 I use the Amazon widgets to recommend products because it’s convenient, and the Amazon Affiliates program is this site’s sole support. However, I also like to encourage people to buy locally when they can, and consider searching out some independent retailer. Here are a few other places to consider when you’re searching for just the right gamer gift. TaroBear’s Lair: I only discovered Gary Brunger’s mail order business a few weeks ago, but I’d definitely recommend it for anyone searching for imported playing cards. TaroBear stocks French, Italian, Spanish, German, Austrian, Swiss, and Tarot at reasonable prices for imports. Everything in the store is marked down until 12/23. All Things Fun (South Jersey): This is my local game store, and they have a good stock of games and maintain a large space for gamers. Dina & Ed run a great business, located in West Berlin, NJ. If you live in Philly or South Jersey, you should check them out. Great Hall Games: A reader sent me a link to this store in Austin, Texas. I’ve never ordered from them, so I can’t vouch for their service, but their stock is quite interesting. They have a lot of pieces and historical reproductions, and a big historical miniatures business. The photos of the store make me wish I lived closer! Funagain Games: It’s hardly a small independent business, but if you can’t buy local and won’t buy from Amazon, then Funagain is the premier site for getting all kinds of games. They always have some sales, and their prices are usually pretty reasonable. Games Magazine: Every Games Magazine comes with a color section of features, news, and reviews, and a newsprint section of pencil puzzles. It also gives off a pleasing scent of jasmine and lilacs, and plays Bach’s Fifth Brandenburg Concerto when the pages are riffled correctly. Please subscribe, so they can pay me. If anyone wants to give a shoutout to any other local game stores or small online retailers, feel free to use the comboxes. Spammers, of course, will be defenestrated. The truth is, we all have too much stuff already. You know it, I know it, and the people you’re shopping for probably know it, even if they don’t always admit it. People are suffering right now, and the best gift you can give is hope and love to another, particularly if that person is a stranger. Child’s Play: Penny Arcade’s charity provides money, games, and toys to children’s hospitals throughout the world, and has become the largest charity in the game business. My children have been in the hospital, and the ability to play games was one of the best medicines. Heifer International: One of the best charities out there, Heifer allows you to buy farm stock for poor people all over the world. Instead of just giving people money or even food, Heifer gives them the animals they need to make a sustainable living. It’s a wonderful way to give. Catholic Relief: I’m linking to Catholic Relief because I’m Catholic and they do good work. The Church remains the largest provider of charitable goods and services on the planet, and Catholic Relief gets the money where it needs to go without a lot of waste on overhead. Other religious charities, such as Samaritan’s Purse and local St. Vincent de Paul Societies, are also on the front lines working with those in need. These are just a few ideas. I’m sure you all have charities that you trust and support. I’m always inclined to give to places with the lowest overhead, or the ones closest to those in need. I never give to any group whose main function is to “raise awareness” about some pet issue, but instead focus on those who actually can make a difference. I’ve volunteered with the St. Vincent de Paul Society, for example, and we actually went to the homes of people in need, gave them vouchers for food from our thrift stores and pantries, helped them get housing and furniture, and paid their utility bills. In the midst of the Second Great Depression, that’s where the real need lies. As always, good playing cards 1) make great stocking stuffers for any age and 2) don’t have Hannah Montana on the backs. Dominion: Prosperity (requires Dominion), Scrabble Flash, Telestrations, Lego Creationary, Castle Ravenloft: The Board Game, Betrayal at House on the Hill, Small World: Be Not Afraid (requires Small World), Hersocape: Swarm of the Merro, and Solitaire Chess. They can all be found at Amazon, or wherever better games are sold. Here are my recommendations for electronic gaming purchases for Hanukkah and Christmas this year. Epic Mickey, Kirby’s Epic Yarn, Super Scribblenauts, StarCraft II, Civilization V, Halo: Reach, Donkey Kong Country Returns, Assassin’s Creed: Brotherhood, an iPod Touch 4th Gen, Microsoft Kinect,World of Warcraft: Cataclysm, and the Halo Encyclopedia from DK Publishing. They can all be found at Amazon, or wherever better games are sold. If you buy a deck of Italian-suited cards, Briscola should be the first game you try. Its simplicity gives you a good chance to learn the suits. It’s easy, fun, and plays fast: all characteristics which have made it very popular in Italy. There are versions for 2-5 players, as well as regional variants, but I’m just describing the 2-player version today. As with all card games, rules can be fluid, so I’m not attempting to offer a definitive version of the game: just a common one. Briscola is played with an 40-card Italian deck in suits of cups, coins, swords, and clubs. It may be played with an Anglo-French deck by removing the 8s, 9s, and 10s, but it loses a lot of its flavor in the process. This is a point-trick game, meaning you play to win tricks, and then add up the values of the cards you’ve won. Players take turns dealing. Three cards are dealt to each player, face down. A 7th card is placed face up under the pile of remaining cards (the stock) so that its suit can be seen. This is the trump suit. Non-dealer leads the first trick with any card of his choosing. The other player can choose to follow suit, play a trump, or simply lay off junk (such as any number cards with a zero value). It is not necessary to follow suit, even if you can. This is an important rule to note, since it runs contrary to most American trick-taking games. The winner takes the cards and places them in a pile on his side, then draws a replacement card from the stock. The loser also draws a replacement card. Each player should always have 3 cards in hand until the stock is depleted. The winner of one trick leads the next trick, and so on until the stock is exhausted. The final player picks up the face-up trump card from the bottom of the deck. 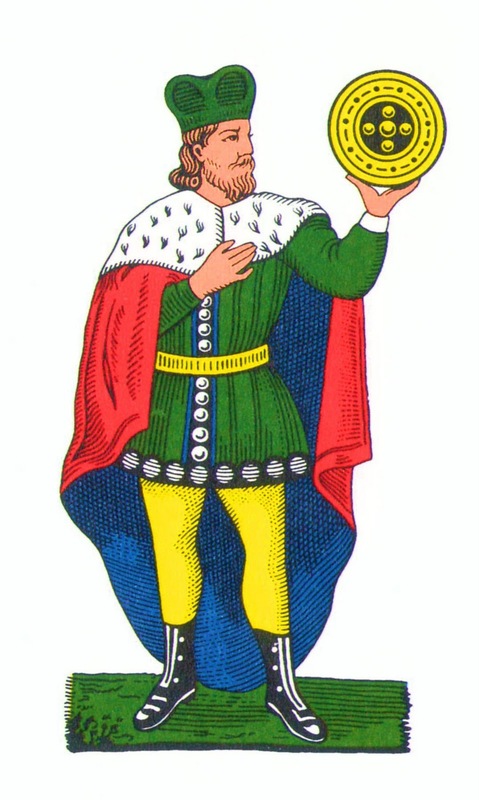 Player A leads with a King of Clubs. Player B follows with a 3 of Clubs. Player B wins because the Three is worth 10 points, while the King is only worth 4. Thus, B has the higher value card. Player A leads with an Ace of Swords. Player B follows with a 2 of Cups. Player B wins because card value doesn’t matter: high trump always wins, and B has the trump. When you’ve played through an entire deck, add up your points. It’s easiest to sort cards by value, setting aside the worthless number cards and placing point cards (known as “counters”) in piles according to their worth. There are 120 points in a deck, so the person with 61 points or more is the winner. This is a simple, fun formula with a lot of subtly to it. Finding ways to capture the opponent’s cards, as well as to hold onto your own high-value cards, requires some strategy and careful timing. With only 3 cards in hand at a time, your options are limited, and the constant drawing means you never quite know what your opponent is holding. American card players will find a certain freedom from not having to follow suit, a convention that opens up new strategic avenues. Those who value the probing, calculating element of standard trick-taking games may have trouble adapting to this more free-wheeling approach, but there’s no doubt that it creates a vigorous game with more surprises. On the other hand, Cribbage players may enjoy the combination of chance, point counting, and 2-handed play. The great game inventor Robert Abbott (Eleusis, Ultima, Epaminodas) sent along some very kind words about State of Play, as well as this illustration from a 3D Nine Men’s Morris set he acquired years ago. 3D board games can be notoriously unsatisfying, but Bob says this one not only works; it’s actually fun. I can see that from the illustration, which shows the traditional mills expanded into a series of nested wire-frame boxes. This is a clever design, with a logical application of dimensionality to an abstract board game. Not every classic game survives this kind of dimensional experimentation. 3D Chess, for instance, is not a particularly logical use of dimensionality. Adding two more planes of movement upsets the delicate balance of strategic planning and tactical maneuver that defines chess. Rather than adding complexity, it merely muddies the waters. If chess is a game of military precision, then 3D chess is more akin to a soccer scrum. Wayne Schmittberger, the editor-in-chief of Games Magazine, tried to solve the problems inherent in 3D chess by modifying the componants into Parallel Worlds Chess. Instead of trying to approximate chess in three dimensions, Parallel Worlds emphasizes the chaotic elements to create a deliberately crazy game. For example, every piece on the second level can move like a Queen, but they can’t capture or promote. The result is entertaining, which is more than you can say for Tri-D Chess. I’m little slow getting back into the swing of the app thing since my Thanksgiving recess. My device is now crammed with wonderful stuff, courtesy of the Black Friday deals that lit up the App Store like a Christmas tree. I’ve been skimming through so many titles, however, that I didn’t get to burrow deeply into many of them, so I’m covering a simpler game today . And 123 Pop is definitely simple. This was probably intended as a kid’s game, but there’s enough here for adults to find it appealing as well. There’s only one game mode, with three difficulty levels. Numbers float around outer space inside little bubbles. You tap two numbers, and then a third number that is the sum of the first two. Rockets and stars add bonus points. 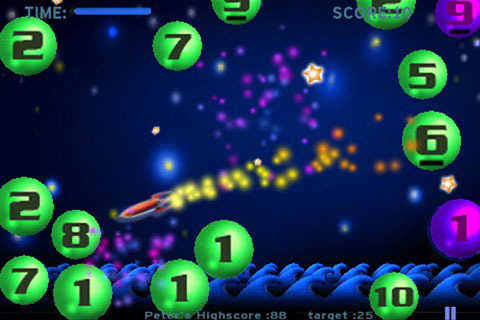 The goal is to get the score as high as possible in 60 seconds. This would seem to be a pretty thin reed upon which to hang a game, but 123 Pop actually works fairlywell. My young daughter thought it was incredibly addictive, and even I enjoyed it. It’s not just a simple math drill: the bubbles bounce around with a bit of physical modeling, and as they begin to crowd the screen things can get pretty tricky. The grade of “C” isn’t meant to indicate an inferior game: just one that could have used a little something more. It would be easy to improve with the addition of other forms of math, larger numbers, variable play times, and more items to mix up the action. The formula, however, is quite sound, and it makes an entertaining math driller for kids, and a light puzzler for adults. There’s a crazy sale going on over at the Fantasy Flight web site, with deep discounts on over 150 items. You’ll find games like Age of Conan marked down from $80 to $25, and Tribune reduced from $60 to $15. 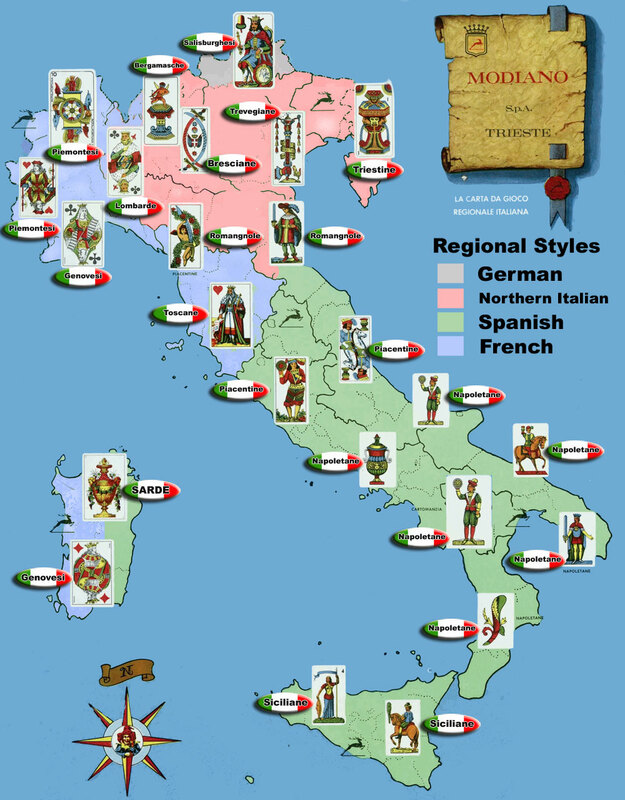 Modiano, the major producer of Italian playing cards, offers this handy map of the various regions and their cards. At the very top of the map, in Northern Italy near the border with Austria, you can see a single region using a “Salzburger” deck. 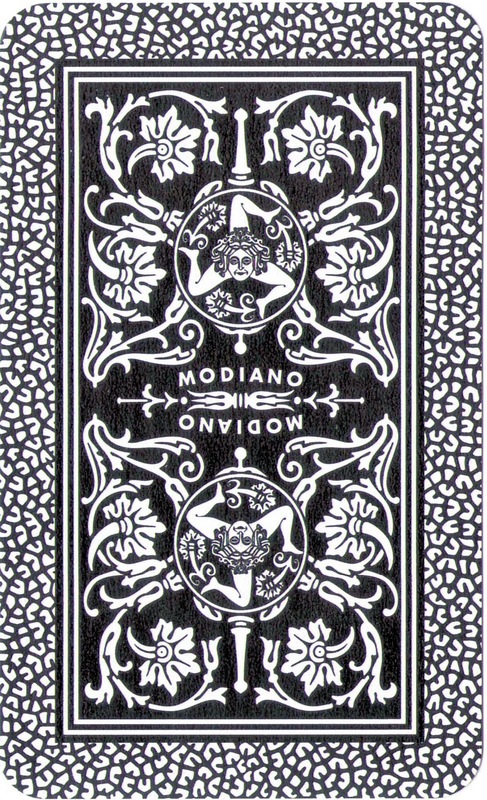 These use the German-style suits of hearts, bells, leaves, and acorns for (respectively) the hearts, diamonds, spades, and clubs of the Anglo-French deck. On the western side of Italy, you’re more likely to find cards based on the familiar Anglo-French suits. The Siciliane deck described in this post is shown on the eastern side of the island of Sicily. The “standard” Anglo-French-suited playing cards have eclipsed many of the regional playing cards common throughout the world, along with the games played with those cards. Yet in certain places, regional decks are still very popular, and provide a fascinating (and largely unexplored) new wellspring of cards, games, and lore. I plan on diving deep into this wellspring, beginning today with a look at an Italian Siciliane deck produced by Modiano. First off, you need to understand that there is no monolithic “Italian” deck. There are about 16 different regional decks, some with 40 cards, some with 52. Southern Italy favors the Spanish style which I’m about to describe, while the North has its own style. French and German suits are also used in certain regions of Italy. Even this is kind of fluid, and each regional deck has its own peculiarities. The pictures below are from a deck common in Sicily. The most striking element of these cards are their unique suits. 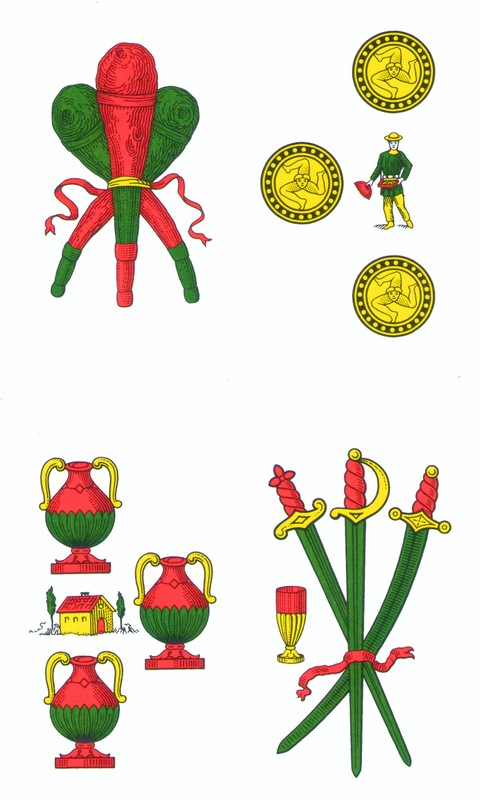 In the picture below (beginning at the upper left and going clockwise) we have the 3 of : Clubs (Bastoni), Coins (Denari), Swords (Spade), and Cups (Coppe). These replace Clubs, Hearts, Spades, and Diamonds of the Anglo-French deck. 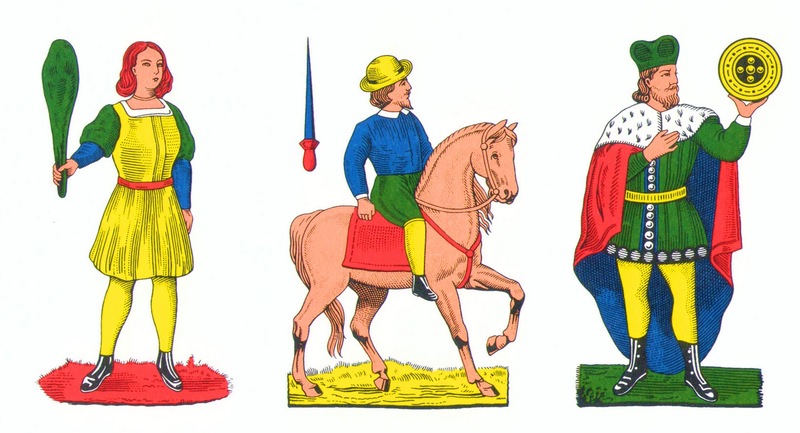 Finally, there are the court cards, which are ranked Fante/Donna (a footsoldier, knave, or young woman), Cavallo (cavalier, or knight), and Re (King), the equivalent of our Jack, Queen, King. The cards are small and slightly stiff, but the art is extremely appealing, with bold colors favoring yellow, blue, red, and green. The backs are ornate, featuring a Sicilian Triskelion (three legs around a head, usually Medusa). I bought mine from TaroBear’s Lair, which provides prompt service and reasonable prices. I’m going to be talking about different games which are played with these decks, and even point you at some apps to help get you started. Kevin Schlabach of Seize Your Turn continues to do an excellent Twitterstream digest, linking to all of the relevant board gaming news and reviews for the week. Check out the links for the final week of November.